Church leaders need to understand the fact that our competition is not other churches; it’s places that provide WOW! Experiences and to which guests compare our churches. While that may seem a negative, it can also be turned into a positive by LEARNING from those top-notch places and their leaders. Hospitality is the foundation of my business philosophy. Virtually nothing else is as important as how one is made to feel in any business transaction. Hospitality exists when you believe the other person is on your side. Hospitality is present when something happens for you. It is absent when something happens to you. Those two prepositions – for and to – express it all. Understanding the distinction between service and hospitality has been at the foundation of our success. Service is the technical delivery of a product. Hospitality is how the delivery of that product makes it recipient feel. Service is a monologue – we decide how we wan to do thins and set our own standards for service. Hospitality, on the other hand, is a dialogue. To be on a guest’s side requires listening to that person with every sense, and following up with a thoughtful, gracious, appropriate response. It takes both great service and great hospitality to rise to the top. People duck as a natural reflex when something is hurled at them. Similarly, the excellence reflex is a natural reaction to fix something that isn’t right, or to improve something that could be better. The excellence reflex is rooted in instinct and upbringing, and then constantly honed through awareness, caring, and practice. The overarching concern to do the right thing well is there or it isn’t. What a great learning environment for churches wanting to improve their Guest Services team! Last week, I posted a series on hospitality based on Le Bernardin, the famous restaurant in NYC owned by Chef Eric Ripert. If this post resonated with you, click on the links below for more. Creating experiences of hospitality allow for positive, uplifting outcomes for human experiences and human relationships. They will help you connect to people coming in your door week in and week out. How will you practice hospitality in your church this weekend? 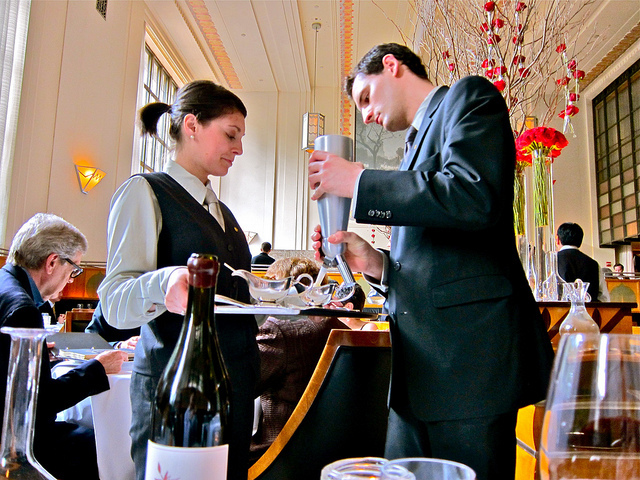 This entry was posted in BookNotes, Culinary, Guest Experience, Guest Services and tagged Church Guest Experience, Church Guest Services, Danny Meyer, Guest Experiences, Le Bernardin, Setting the Table. Bookmark the permalink.